Denaturing high performance liquid chromatography is a relatively new method by which heteroduplex structures formed during the PCR amplification of heterozygote samples can be rapidly identified. The use of this technology for mutation detection in hereditary non-polyposis colorectal cancer (HNPCC) has the potential to appreciably shorten the time it takes to analyze genes associated with this disorder. Prior to acceptance of this method for screening genes associated with HNPCC, assessment of the reliability of this method should be performed. In this report we have compared mutation and polymorphism detection by denaturing gradient gel electrophoresis (DGGE) with denaturing high performance liquid chromatography (DHPLC) in a set of 130 families. All mutations/polymorphisms representing base substitutions, deletions, insertions and a 23 base pair inversion were detected by DHPLC whereas DGGE failed to identify four single base substitutions and a single base pair deletion. In addition, we show that DHPLC has been used for the identification of 5 different mutations in exon 7 of hMSH2 that could not be detected by DGGE. From this study we conclude that DHPLC is a more effective and rapid alternative to the detection of mutations in hMSH2 and hMLH1 with the same or better accuracy than DGGE. Furthermore, this technique offers opportunities for automation, which have not been realised for the majority of other methods of gene analysis. HNPCC is an autosomal dominantly inherited disorder that predisposes mutation carriers to an increased risk of early onset colorectal cancer in the absence of any premalignant marker . In addition, mutation carriers are at risk of developing a range of other epithelial cancers, which include endometrial cancer, CNS tumors and cancers of the upper renal tract . The incidence of HNPCC is not accurately known, but is estimated to account for between 1% and 2% of all colorectal cancer patients [3, 4]. HNPCC is caused by defects in genes that are associated with DNA mismatch repair. DNA mismatch repair is a complex process that involves many genes, four of which have been directly associated with the disease. These genes include hMSH2 on chromosome 2p [5, 6], hMLH1 on chromosome 3q , hPMS2 on chromosome 2 , and hMHS6 on chromosome 7 , for a detailed review see Papadopoulos and Lindblom . Tumors arising in HNPCC families have a characteristic genetic signature of microsatellite instability (MSI), which can be assayed for by comparing microsatellite DNA profiles from the tumor to profiles from constitutional DNA [11, 12]. Two of the four genes account for the majority of HNPCC families, these being hMSH2 and hMLH1 [13–16]. Since there are several genes associated with HNPCC the search for inexpensive, rapid detection methods are critical if large scale genetic screening strategies are going to be implemented to offer patients accurate surveillance measures to improve survival. For a mutation-detection strategy to be effective it must fulfil several requirements. It should have the capacity to be automated, it ought to be inexpensive and it must be accurate. To date most mutation detection strategies do not fulfil all three of these requirements. Most have not been automated or are relatively expensive and none have been assessed properly for their accuracy and this includes direct DNA sequencing, considered to be the "gold standard". There are two mutation detection strategies that are most commonly used for genes involved in HNPCC, these being denaturing gradient gel electrophoresis (DGGE) and single strand conformation polymorphism analysis (SSCP). A third test, the protein truncation test (PTT) is also used for mutation detection in HNPCC, which requires the use of RNA for analysis. Its sensitivity is limited in that it will only identify nonsense mutations and premature stop codons . Other techniques do exist but they are not widely used and suffer from the problem of being technically difficult (examples of which include chemical/enzymatic cleavage mismatch assay and temperature gradient gel electrophoresis) or do not detect a significant majority of mutations. DHPLC is a new technique that lends itself to automation by virtue of being performed in a column rather than a gel format and providing a rapid, inexpensive and reliable assay. This technique is based on the observation that heteroduplexes will, under partially denaturing conditions, be more likely to denature, compared to their homoduplex counterparts . DHPLC analysis has several advantages compared to other methods of analysis, which include the absence of any radioactive labeling or the purchase of purpose designed oligonucleotides, as is the case with DGGE. A recent report has compared DHPLC with single strand conformation polymorphism (SSCP) analysis and two dimensional gene scanning (TDGE) analysis and direct sequencing. The results of this comparison indicate that DHPLC is very similar to direct sequencing in terms of sensitivity . No comparison has been reported between DHPLC and DGGE analysis. In this report we compare and contrast mutation detection using DGGE with that of DHPLC using 95 families that have previously been screened by DGGE analysis revealing 34 changes . A further 30 families were also included in the study as they had subsequently been shown to harbor changes in hMSH2 or hMLH1. Together the results indicate that DHPLC is a much more accurate screening assay for the analysis of genes associated with HNPCC and it can be performed much more rapidly. A total of 130 unrelated patients were screened for mutations and polymorphisms in hMLH1 and hMSH2 using DGGE and DHPLC. The diagnosis of HNPCC was made on the basis that all patients had family histories consistent with the Amsterdam criteria . All patients provided informed consent for genetic studies after appropriate genetic counseling for HNPCC. Genomic DNA was isolated from EDTA blood according to the method described by Miller et al. . Briefly, blood samples were mixed with erythrocyte lysis (EL) buffer (155 mM NH4Cl, 10 mM KHCO3, 1 mM EDTA, pH 7.4). The lysate was centrifuged, washed twice with EL buffer, and the intact lymphocyte pellet resuspended in nuclei lysis (NL) buffer (2 ml; 100 mM TRIS-Cl, pH 8.0, 100 mM NaCl, 2 mM Na2EDTA, 1% SDS and 1 mg/ml proteinase K), and incubated overnight at 55°C. The next day, 333 ul/ml of sample of 6 M NaCl was added, mixed and centrifuged to remove cellular proteins from the solution. The supernatant containing the DNA was placed in a fresh tube and the DNA precipitated with ethanol. The resulting DNA pellet was washed with 70% ethanol, dried briefly and then reconstituted in TE buffer (10 mM TRIS-Cl, pH 8.0, 1 mM EDTA) to a concentration of 500 ng/ul. DGGE analysis was essentially performed according to the methods of Wijnen et al. [23, 24]. Briefly, PCR amplification was performed using 250 to 500 ng of genomic DNA, 1U Taq polymerase (Boeringher/Mannheim), 200 μM each nucleotide, 4 to 10% glycerol, 10 mM Tris-Cl (pH 9.0), 1.0-5.0 mM MgCl2 and 1.0 μM concentrations of the appropriate forward and reverse primers. A GC clamp was incorporated at the 5' end of one primer of each pair for DGGE analysed as described previously Wijnen et al [23, 24]. The primer sequences for each exon of hMSH2 and hMLH1 were exactly as described. 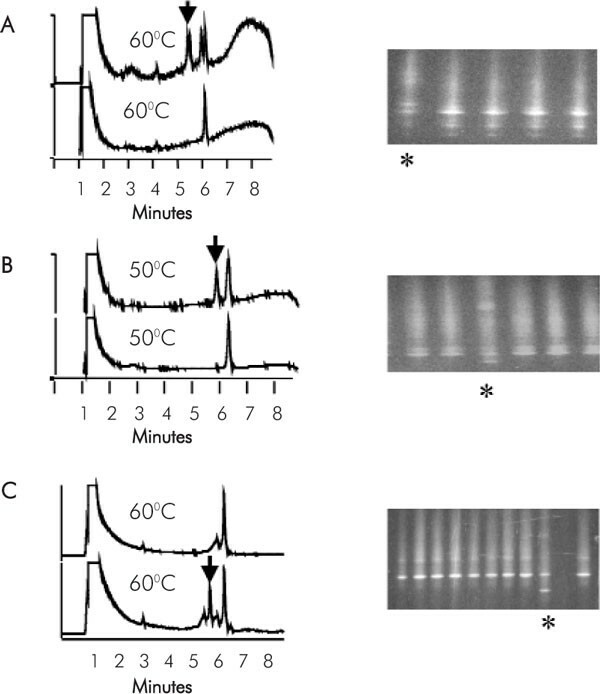 PCR amplification was achieved by an initial denaturation at 94°C for 5 min followed by 35 cycles of 94°C for 1 min, 55 to 58°C for 1.5 min and 72°C for 2 min then a final extension step at 72°C for 10 min. 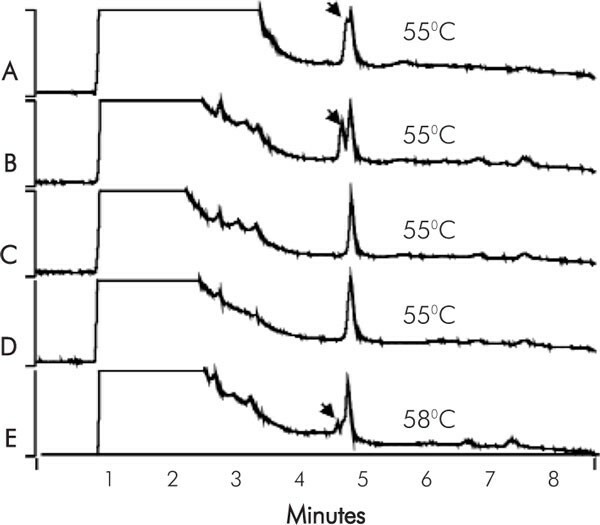 DGGE was performed by separating 5 to 15 μl of PCR product mixed with an equal volume of gel loading buffer (15% Ficol1, 0.25% Bromophenol Blue, 0.25% Xylene Cyanol) on a 10% polyacrylamide gel that contained a denaturing gradient (100% denaturant is 40% formamide, 42% w/v urea) suitable for each exon being analysed (see Table 1 for exon specific gradients). The gel and electrophoresis buffer were both TAE (40 mM Tris acetate pH 7.5, 1 mM EDTA). DGGE separation was performed overnight for 16 hours at 0°C and 40 V and visualized by ethidium bromide staining, UV transillumination and photography. PCR amplification for DHPLC analysis was performed using primers previously designed for SSCP analysis of both hMLH1 and hMSH2 (see Table 2) with minor modification. The reaction consisted of 1.0 μM each primer, 1U Platinum Taq (Gibco-BRL), 2-5 mM MgCl2 and 200 μM each dNTP. These primers were based on Liu et al. , Wijnen et al. , Kolodner et al. , Liu et al. , with minor modification. PCR amplification was achieved by an initial denaturation at 94°C for 5 min followed by 14 cycles of 94°C for 1 min, 7°C touchdown range for 1.5 min and 72°C for 2 min then 20 cycles using an annealing temperature 0.5°C lower than the bottom of the touchdown range. The annealing step was performed as a touchdown protocol with a 7°C range, decreasing 0.5°C/cycle over 14 cycles. This was followed by a final extension step at 72°C for 10 min, a final denaturation step at 95°C for 5 min and a slow annealing step from 95°C to 65°C over 30 min to promote heteroduplex formation. The PCR was performed on a PCR express (Hybaid) instrument equipped with a heated lid to avoid the use of mineral oil. DHPLC analysis was performed using a Varian Helix system (Varian Inc., Walnut Creek, CA). PCR products (2-5 μl) were injected directly into a DNA Eclipse (Hewlett Packard) or Helix (Varian) column and eluted from the column using an increasing acetonitrile gradient and a column oven temperature suitable for each exon of hMLH1 and hMSH2 (see Table 3). 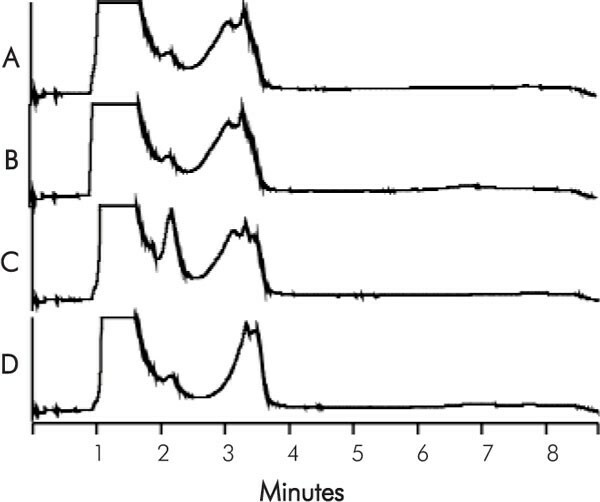 Heteroduplexes formed during PCR of a heterozygote sample were detected as an additional peak eluting before the homoduplex peak. The detection of heteroduplexes was made simpler with the use of DHPLC review software supplied from Varian. The predicted melting temperatures of the double stranded DNA products were obtained by using the DHPLC-MELT program available from http://www.insertion.stanford.edu/melt.html. For each segment a negative control fragment (amplified from DNA isolated from a normal healthy donor who had no family history of disease) was run through the denaturing column at the non-denaturing temperature of 50°C. The 50°C peak profile was then compared to the Stanford melting temperature profile of the respective fragment as well as three 1°C increments on either side of predicted melting temperature. Partially denatured conditions were established when a shift in retention time of at least or equal to 30 seconds across a 1°C increment range. The optimal melting temperature was always taken as the higher temperature, under partially denaturing conditions that did not exhibit profile degradation. All heteroduplexes were subject to DNA sequencing to determine the precise genetic change on a semiautomated sequencing unit (model 310, Perkin-Elmer Applied Biosystems Division, Foster City, CA) using dideoxy sequencing of the PCR products was performed using version 1 BIGDYE dideoxy sequencing Ready Rxn kit (Perkin-Elmer, Foster City, CA). From a total number of 130 patients 41 genetic differences were identified by DGGE. 15 alterations were found in hMSH2 and 26 in hMLH1. All alterations in hMSH2 and hMLH1 were checked against the published sequence (accession number U03911 and U07418, respectively). A brief description of the affected exon in either hMSH2 or hMLH1 is shown in Table 3. All 130 samples that had been subjected to DGGE analysis were tested by DHPLC to determine if this methodology was at least as reliable as DGGE. All DNA fragments analyzed were shorter than 420 base pairs in length. A size limitation of 450 bp was chosen so that the flow rate through the denaturing column and denaturing gradient remained constant. The only parameter that was varied in this analysis was the column temperature. Predicted DNA melting temperatures are shown Table 3. The actual melting temperature of the heteroduplexes varied from the predicted by a maximum of 4°C and most heteroduplexes melted at one of the predicted temperatures. A total of 50 changes were observed using DHPLC which included 9 additional changes that were not detected by DGGE. DHPLC analysis revealed that single base pair changes, deletions or insertions could be readily identified as well as larger base pair changes (for examples see Fig. 1). A potential difficulty with DHPLC analysis could be the identification of more complex changes such as common polymorphisms that may occur in the proximity of a mutation. The identification of the mutation may be compromised by virtue of the polymorphism. The heteroduplex melting profile of exon 8, hMLH1, which harbors a common polymorphism (G to A) at position 655 and a mutation (T deletion) at nucleotide 672 is shown in Fig. 2. Each change gave a distinct and unique profile both individually and in combination. There were nine additional changes not found by DGGE that were apparent by DHPLC as indicated in Table 3. The changes included a C to T substitution at position +51 upstream of the splice site in exon 6 of hMLH1; a T to C substitution at position +6 in exon 13 of hMSH2; and a G to A substitution at position 884 in exon 10 of hMLH1. All three changes were easily detected by DHPLC (see Fig. 3). Of particular note was the identification of four substitutions and one deletion that were detected in exon 7 of hMSH2, which could not be observed when analysed by DGGE. Interrogation of the sequence of exon 7 did not reveal any unusual melting domains, which could adversely affect the melting temperature in the presence of a GC-clamp. Mutations undetected by DGGE that were detected by DHPLC. PCR products (5 μl) were separated on a Helix column at the indicated temperature and a 0.45 ml/min flow rate. A linear increasing acetonitrile gradient was used to elute the DNA from the column. Arrows indicate the presence of heteroduplex species on DHPLC traces for (A) hMLH1 exon 6,544 +51 T to C; (B) hMSH2 exon 13,1558 +6T to C and (C) hMLH1 exon 10,884 G to A. The analysis of fragments with DNA sequence variations usually result in distinct melting profiles, sometimes however, we observed similar profiles for DNA fragments, harbouring non-identical changes from the wild type allele and to each other, an example is shown in Fig. 4. In this example two different genetic changes, a substitution at position 965 (G to A) and another at position 1009 (C to T) in exon 6 of hMSH2 resulted in very similar profiles whereas a 984 C to T change was distinct. Predictive ability of DHPLC profiles. Identical profiles were observed at the predicted oven temperature for both a 1009 C>T substitution (A) and a 965 G to A substitution (B) in exon 6 of the hMSH2 gene. These profiles were different to those obtained for a 984 C to T substitution (C) and no substitutions (D) in the same fragment. PCR products (5 μl) were separated on a Helix DHPLC column under partially denaturing conditions using a flow rate of 0.45 ml/min and an increasing linear acetonitrile gradient. Finally, DNA melting temperatures and the resulting melt profiles correlate very well when there are small base composition changes (small insertions, deletions and substitutions) but are not so well associated when larger changes are present. It was our observation that some changes were not as stable as others. Identification of unusual heteroduplexes by DHPLC appeared to be more accurate than by DGGE (see Table 4) as some of the conformers were undetectable using this methodology. Evidence for this is shown in Fig. 3. In total, we identified in our cohort of samples 9 examples where DGGE failed to detect heteroduplex differences. Conversely, no DNA sequence variations identified by DGGE were undetected by DHPLC. In total, 50 changes were identified, 50 by DHPLC and 41 by DGGE suggesting that DHPLC is a more accurate method by which mutations can be identified, in HNPCC patients using the described protocol. Within the total sample population, 130 index patients were studied by both DHPLC and DGGE. Using this approach it was impossible to determine if other changes had been missed by either of the two techniques, as direct sequencing was not performed on any of the gene fragments unless a change had been observed. The analysis of genes associated with the colorectal cancer predisposition HNPCC remains problematic since there are a number of different genes, which predispose to this disorder. In this report we have focused on the two genes (hMSH2 and hMLH1) that account for the majority of families that are consistent with a diagnosis of HNPCC. Several different techniques have been utilized in the identification of genetic differences in hMSH2 and hMLH1, however, in this report we concentrated on comparing DGGE with DHPLC analysis as there are several reports suggesting that it is a superior mutation detection technique after direct sequencing, see Ziao and Oefner . The only significant study to evaluate a number of different mutation detection strategies and DHPLC focused on single strand conformation polymorphism analysis (SSCP), conformation sensitive gel electrophoresis (CSGE) and two dimensional gene scanning (TDGS). The results of this study indicate that DHPLC is as sensitive as direct sequencing . In the current study an evaluation between DHPLC and DGGE has been performed which further confirms the superior nature of DHPLC against many other mutation detection methods except perhaps direct sequencing. In this study we have investigated a series of families that were diagnosed by virtue of the fact that they adhered to the Amsterdam criteria . There are other criteria that could have been used but for this comparative analysis it was considered more meaningful to test a minimum set of similar families, which could be easily compared. Using the conditions described by Wijnen et al. [23, 24] we have found that DGGE analysis for mutation detection is relatively rapid and accurate. A series of changes were identified by this technique, which included single base pair substitutions, deletions and insertions, as well as larger genetic alterations . DHPLC on the other hand appears to be a more accurate method of analysis since 9 additional mutations were identified using this technique, which could not be detected by DGGE analysis. Since we did not compare direct sequencing with DHPLC analysis it is impossible to determine the relative sensitivity of DHPLC, however, a recent report suggests that the detection rate is very similar . Of particular interest was the finding of 5 different and distinct mutations in exon 7 of hMSH2, which were not identified by DGGE analysis. Examination of the predicted melting temperatures does not suggest significantly different melting temperatures in most domains except in the region immediately adjacent to the GC-clamp, which may interfere with the structure of the heteroduplex. This may influence the role of the GC-clamp for DGGE analysis, which is not present for DHPLC analysis. In comparing the two techniques there are advantages and disadvantages of both methods. The primary disadvantage of DGGE is the initial time required to establish the appropriate melting conditions to achieve optimal separation of mutant alleles. This requires the use of 2-D gradient gels and knowledge about the predicted DNA melting temperature. Several programs have been developed to predict DNA melting temperatures and most use the MELT 87 program developed by in 1987 . DHPLC as opposed to DGGE does not require extensive 2-D gradient gel electrophoresis but knowledge about the predicted DNA melting temperature is required. The predicted melting temperature proved very useful in determining the correct temperatures for small changes such as single base pair substitutions, insertions or deletions. When larger changes were analyzed at higher temperatures there was a slight loss of predictive accuracy, which was most likely due to the instability of the particular heteroduplex and its consequent breakdown. In contrast to single nucleotide polymorphism (SNP) analysis by DHPLC, mutation screening by DHPLC should include analysis at lower than predicted or even non-denaturing temperatures to detect larger sequence changes. This would increase the sensitivity of mutation detection by DHPLC. All temperatures that were predicted were within four degrees of the actual temperature. In summary, the predictive power of the algorithm proved to be essential for rapid analysis and compared with DGGE optimization of the conditions for DHPLC also proved to be particularly advantageous. The speed at which DHPLC analysis is performed allowed the accurate identification of melting temperature within 30 minutes of analysis. The analysis of DNA fragments at different temperatures for mutation detection must be exhaustively analyzed compared to other applications for DHPLC. An important difference between mutation detection and for instance SNP analysis (where rapid throughput is required) is the extent to which melting temperatures are interrogated. Using DHPLC for SNP identification may have limitations as some SNPs will not necessarily be identified unless a range of temperatures are tested on each segment of DNA under investigation. Elution profiles appear to be consistent between fragments of DNA that harbor the same change when analyzed during one run of the system. Unique elution profiles were found to generally occur for different mutations offering the possibility of unique "family mutation" profile analysis by DHPLC. We cannot recommend this since some mutations due to different base pair changes did result in elution profiles that were almost identical. Taken together, we considered that DHPLC is not an appropriate substitute for DNA sequencing. In comparison to DGGE, DHPLC represents a relatively cost effective alternative. If capital costs are ignored for DGGE and DHPLC, the running cost of DHPLC is approximately 90 US cents per sample with a throughput rate of approximately 5 minutes per sample. DGGE is less expensive to perform with respect to consumable costs but requires post-resolution manipulation to visualize the results, which effectively make this analytical procedure more expensive than DHPLC. Of particular note is the speed of genetic screening by DHPLC, which is far superior to DGGE and indeed, DNA sequencing, when used as a screening tool. The most expensive consumable cost is replacement of the column, which should be used according to the manufacturers' instructions to maximize column life. So long as this number of injections can be assured from the column the cost effective advantage of DHPLC is much greater than DGGE. The use of DHPLC analysis for the identification of mutations represents a significant move forward in the diagnosis of HNPCC. There are, however, aspects of DHPLC analysis that require attention prior to this approach being accepted as a standard laboratory procedure. A potential limitation of this technique is the variability in column life, which may be a function of temperature particularly if the columns are continuously used at a temperature greater than 60°C (Varian Inc., Melbourne, personal communication). 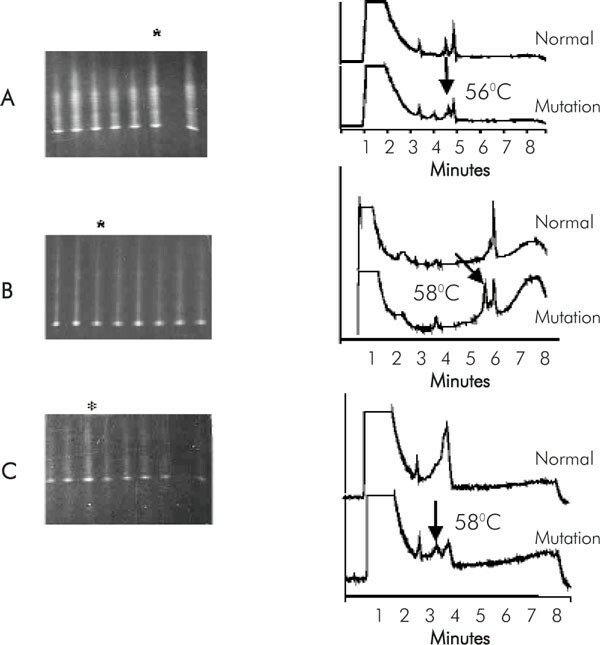 The DNA denaturing temperature estimates generated from the DHPLC-MELT algorithm predicted DNA melting temperatures relatively accurately for single base changes and single base pair insertions and deletions. Larger deletions (over 3 base pairs) or complex changes are also easily identified with careful selection of column temperature. In summary, DHPLC represents a cost-effective and rapid approach to the identification of genetic changes in HNPCC. DHPLC technology accelerates mutation analysis with improvements in sensitivity and specificity resulting in a more cost-effective approach to mutation detection.